What do you do when the weather is set fair but you are still hobbling around thanks to a couple of dodgy back muscles? Well, I wasn’t about to sit around at home and miss a good weather day so down went a couple of painkillers and, with a hot water bottle tucked into the small of my back to warm and relax the muscles, off we went over to Borrowdale and on up to the Honister Slate Mine for a steady walk up to Fleetwith Pike and then over to Haystacks. With a pair of walking poles giving the back muscles a helping hand and the painkillers doing what it said on the tin we had a lovely walk in almost perfect weather. 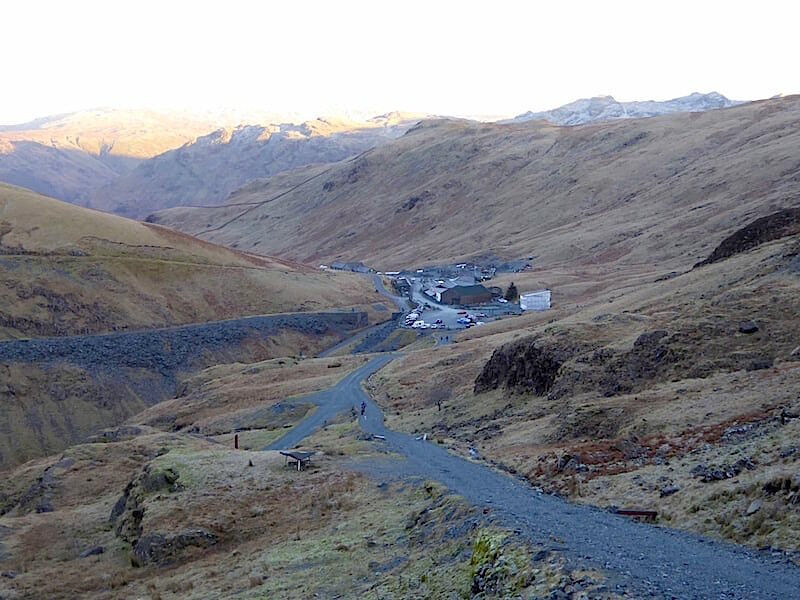 The Honister mine is closed until 14th January while the staff take their annual leave so there were no parking charges for the car park today. Several cars were parked when we arrived, with a few walkers already on their way up the various paths, while others were still getting kitted up. One or two wandered over to the cafe/shop/toilets only to return with the ‘its closed’ news, somewhat disappointing if you’re desperate for a coffee or the loo before you start out. 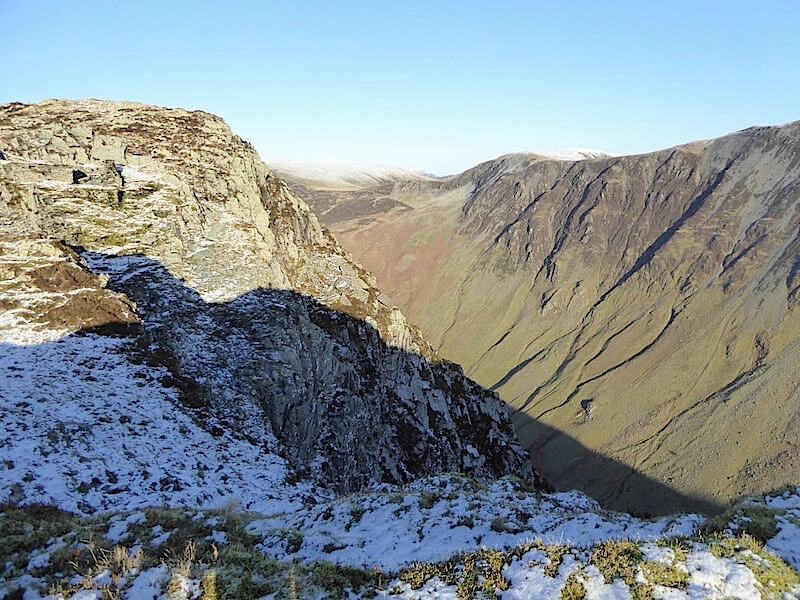 Fortunately we needed neither facility so off we went up the path with this view of the Honister side of Dale Head’s steep slopes. 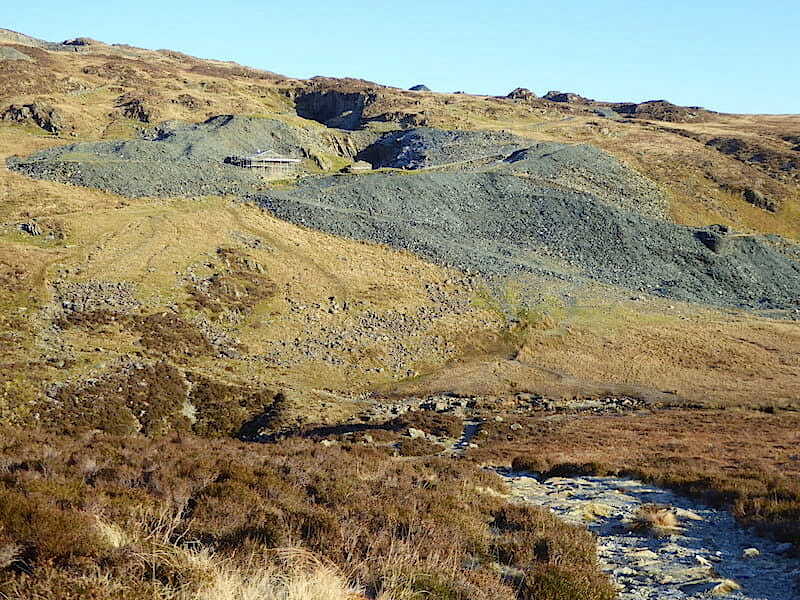 A look back at the mine and parking area from the rock cutting. 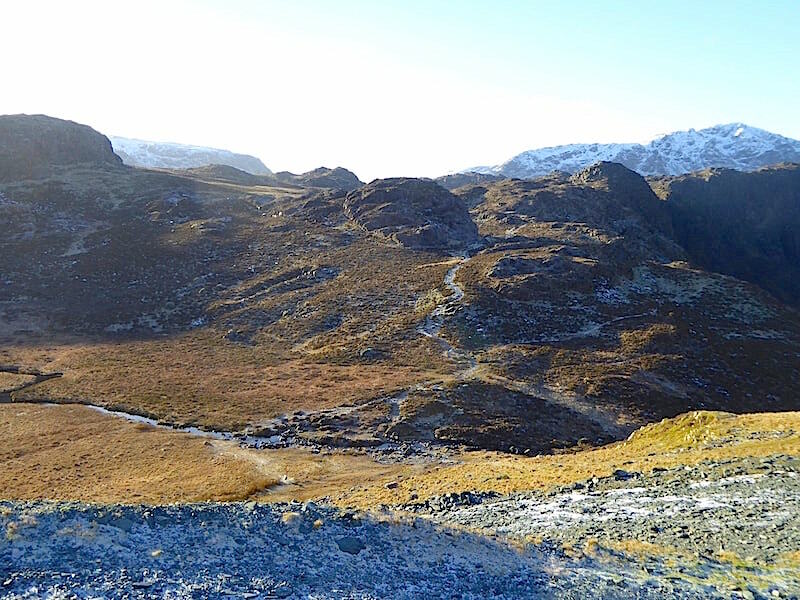 Up at the site of the old winding house with a look ahead along the route over to Haystacks, which is the little rounded hump just peeping up over what looks like the end of the path. 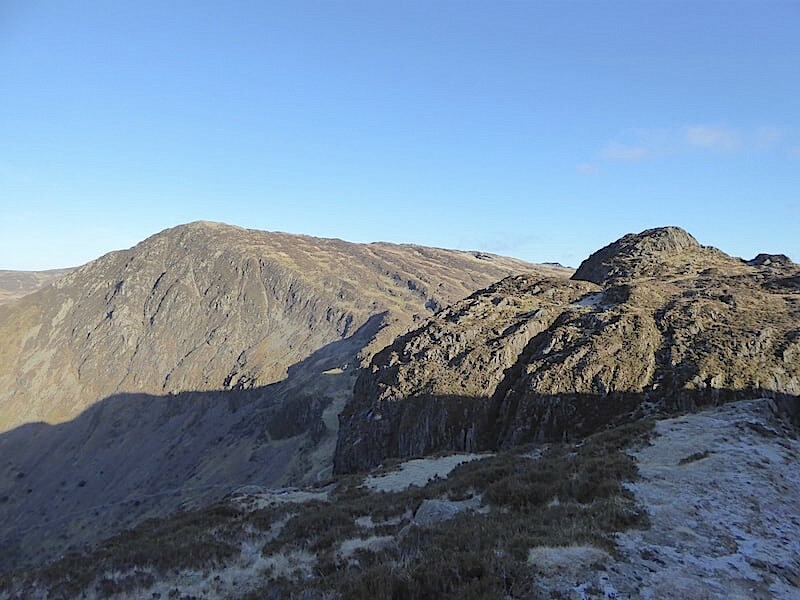 To the left of it is Pillar with High Crag to the right of it. We’re still in shade, its very icy and it feels and looks like an alien landscape, almost lunar in appearance. 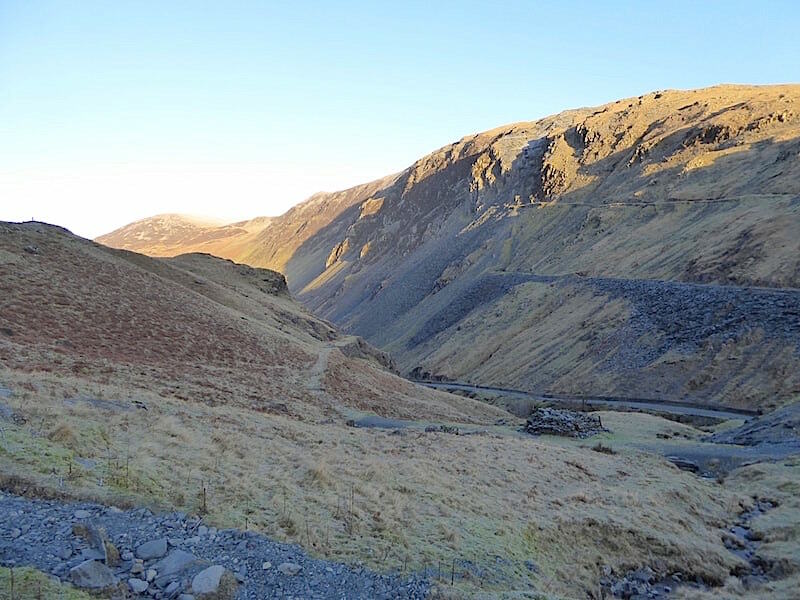 We turn right off the main path at the winding house and begin to make our way over to Honister Crag. Its usually very soggy across this section but we had no wet boots today thanks to the solid and icy ground. 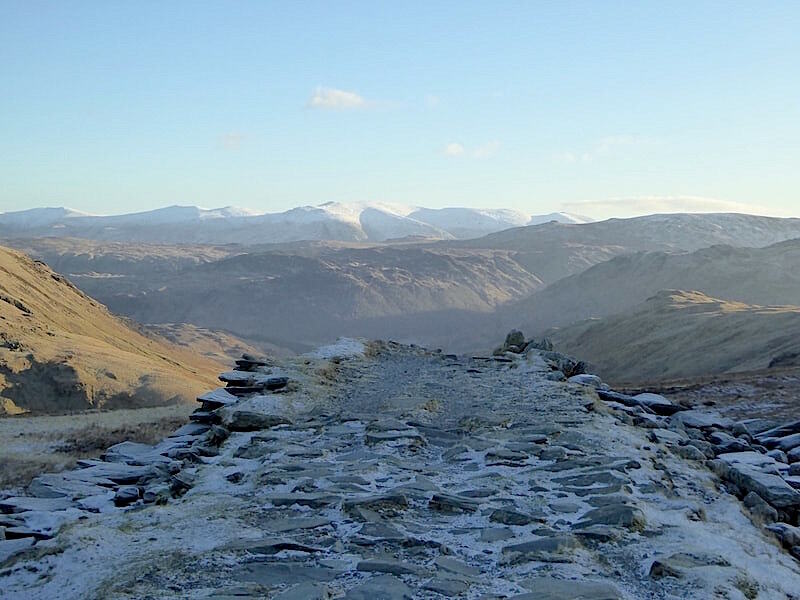 Before we turned off I took a look back from the site of the old winding house over to the Dodds and the Helvellyn range on the distant, and somewhat hazy, skyline. 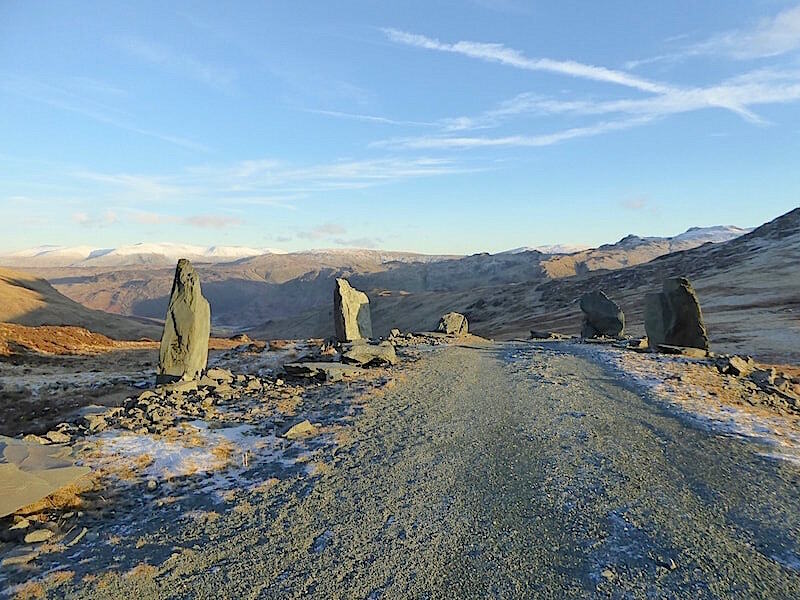 Standing stones bordering the mine road, they made me think of an ancient processional way guiding chanting pilgrims on their way to a bygone pagan festival. On the other hand if you were less given to fanciful notions you might just imagine old wagons full of slate trundling up and down. 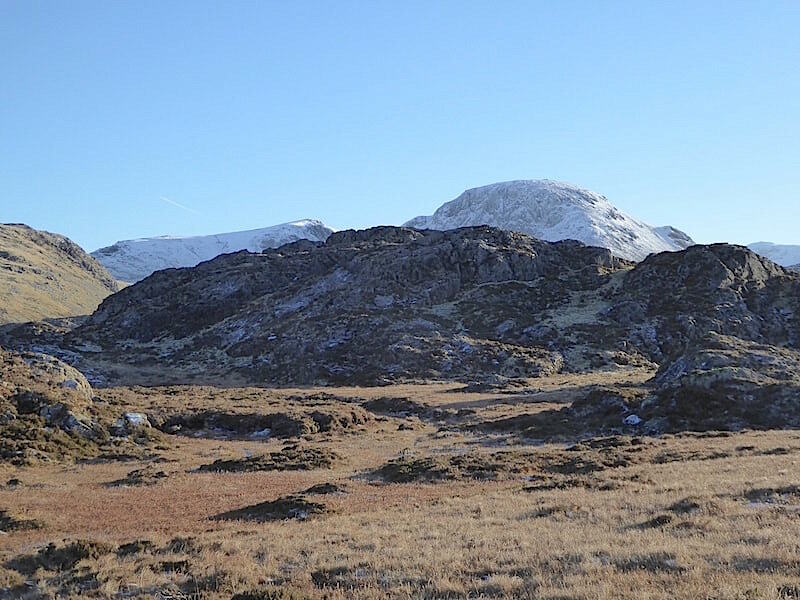 Being neither pilgrims or old wagons, although the latter might be debatable, we don’t follow the road very much further and soon branch off to continue on over the crispy, crunchy grasses up to Honister Crag. 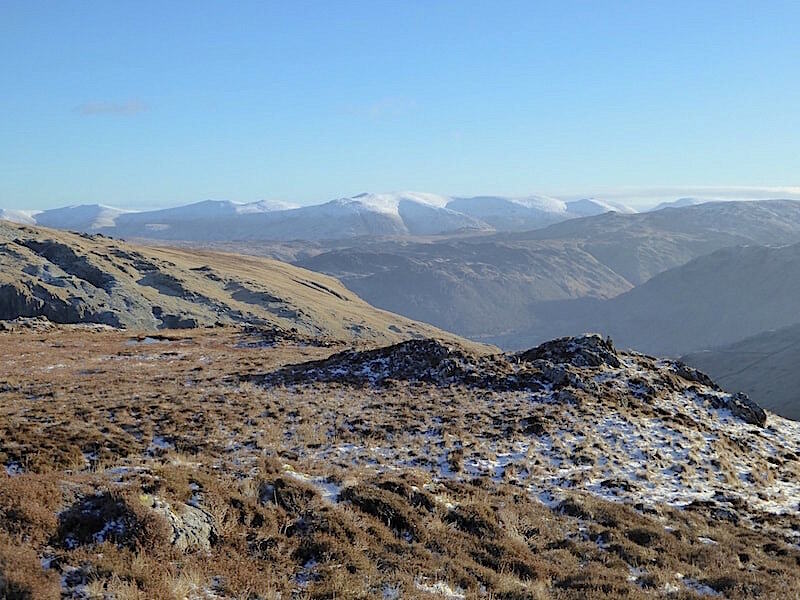 The snow covered Dodds and Helvellyn fells are impossible to ignore and I just had to keep taking a look back at them every so often. Why, I wonder, when they look exactly the same as they did the last time I looked? 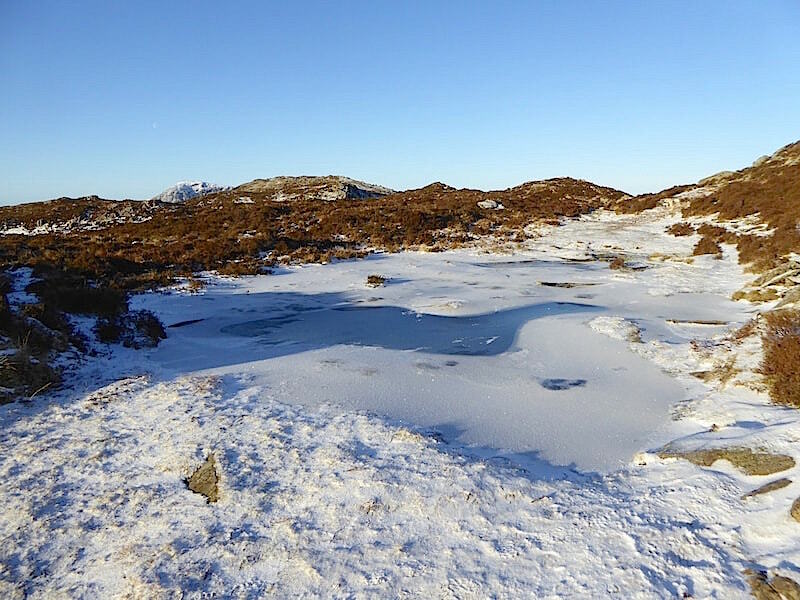 A thick crust of ice over one of the tarns just before we reach the top of Honister Crag …..
….. and a dizzying look down into the Honister Pass from the little hillock just above the tarn. 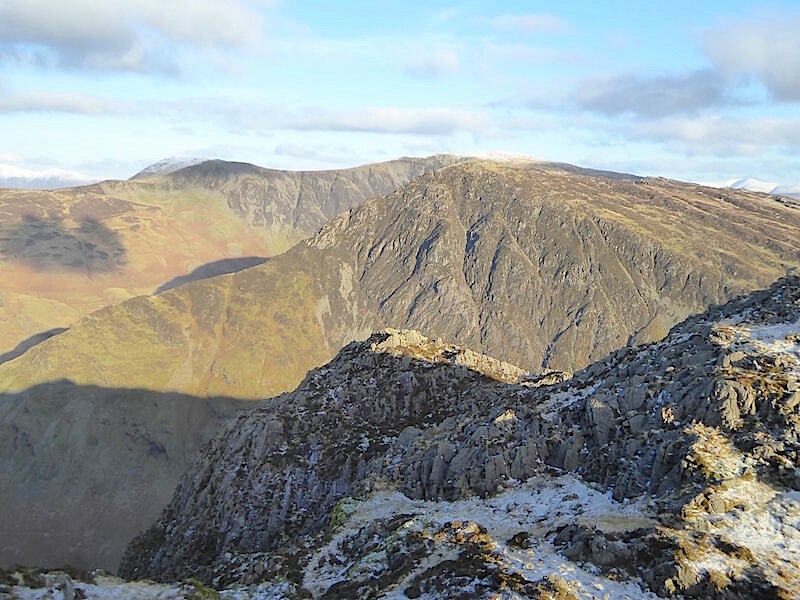 From here we move on to the high point of Honister Crag, Black Star, which is just opposite us on the left of the shot. 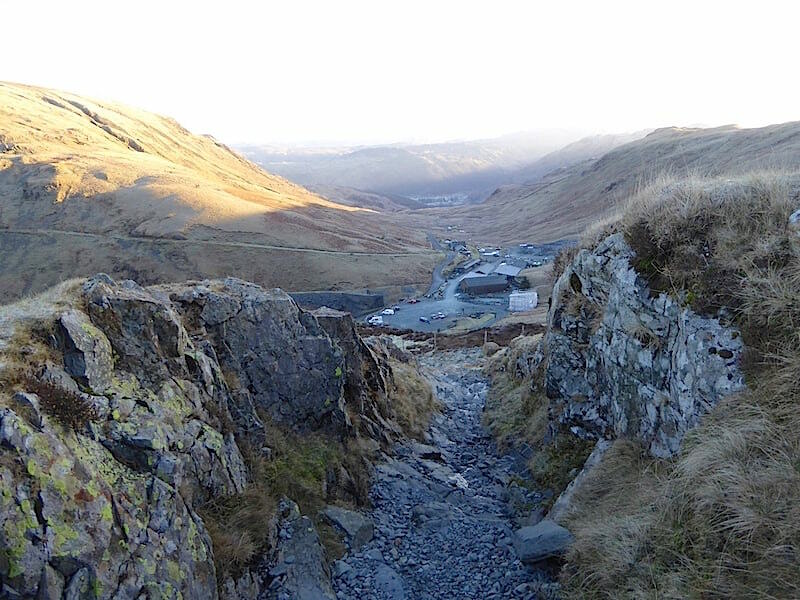 A view of Dale Head’s fearsome looking southern crags as we cross over to Black Star …..
….. and an old mine building perched on the slopes of Black Star, just below the summit. 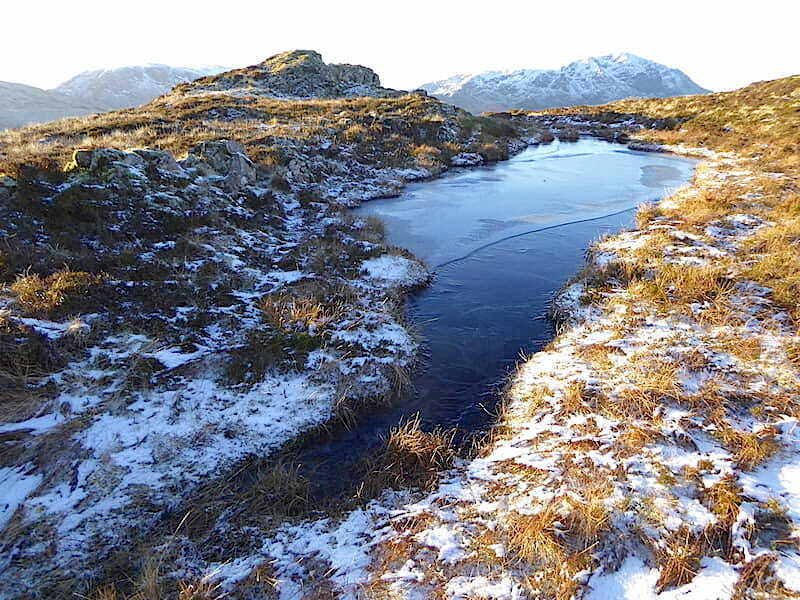 A frozen pool stretched across the path so we kept to the outer edges of it just in case. The path to the top of Black Star reappears at the far end and then goes off up to the right of the shot. 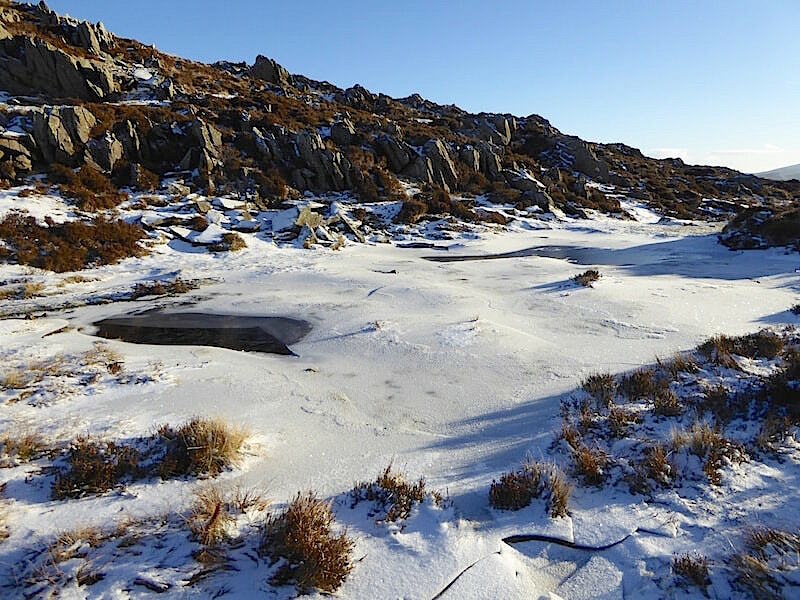 A look back along the frozen pool as we reach the other end of it. 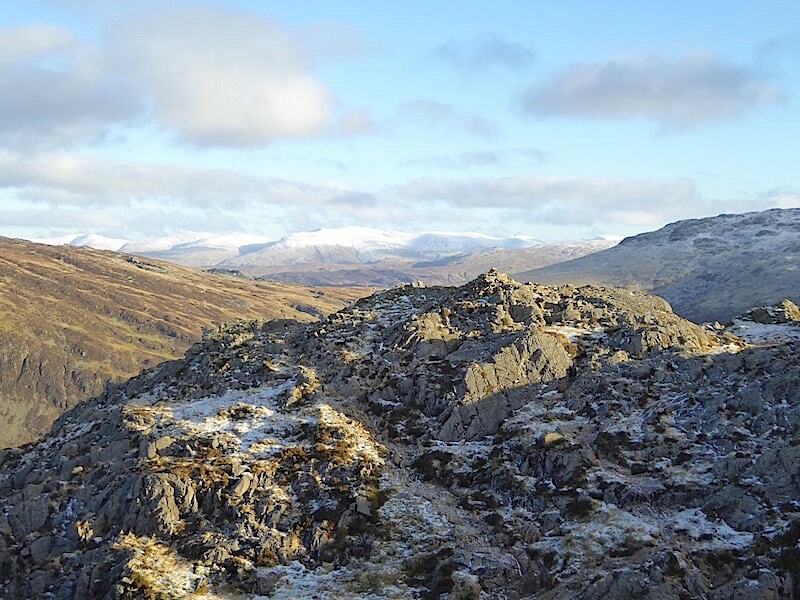 Once we were back on the path there was just a short climb to the top of Black Star and directly opposite is this view of Dale Head’s crags and its snowy summit beyond them. We did notice a couple of walkers up on the summit area but they don’t show up very well in the shot. 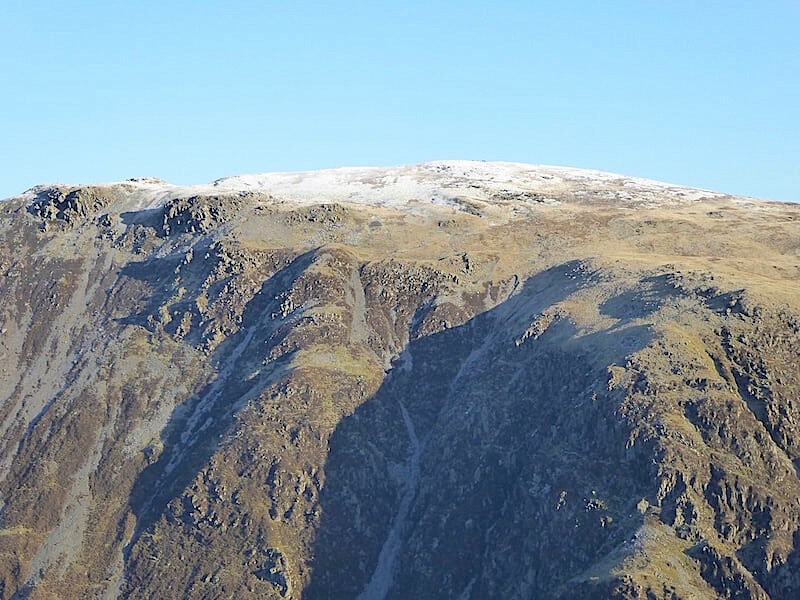 To the left of Dale Head we have a view of Hindscarth Edge with snow topped Hindscarth behind it …..
….. to the left of Hindscarth are Robinson, with just a dusting of snow, and Grasmoor, with quite a lot of snow, to the left of it. 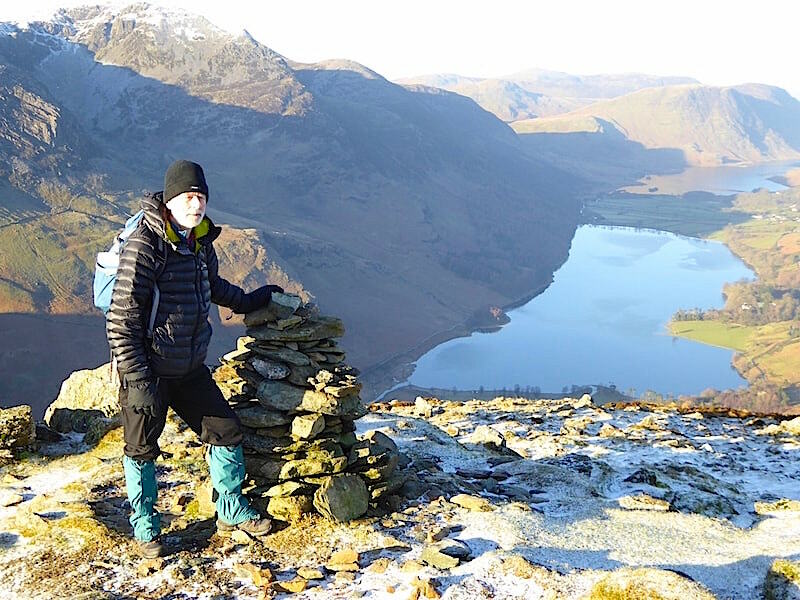 It was just a little draughty up here so having admired the views we dropped down from the top …..
….. and took a sunny and breeze free stroll over to Fleetwith Pike. 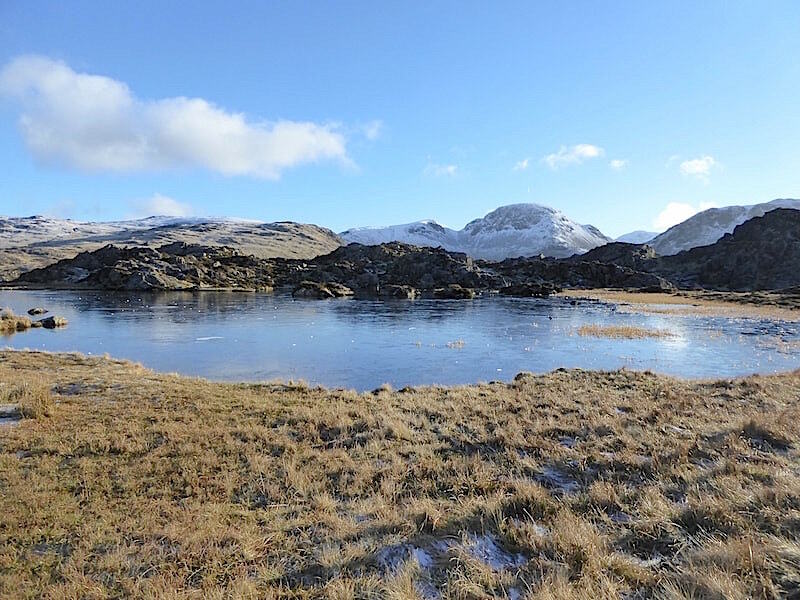 Another frozen tarn as we cross over the normally squelchy dip between the two tops. 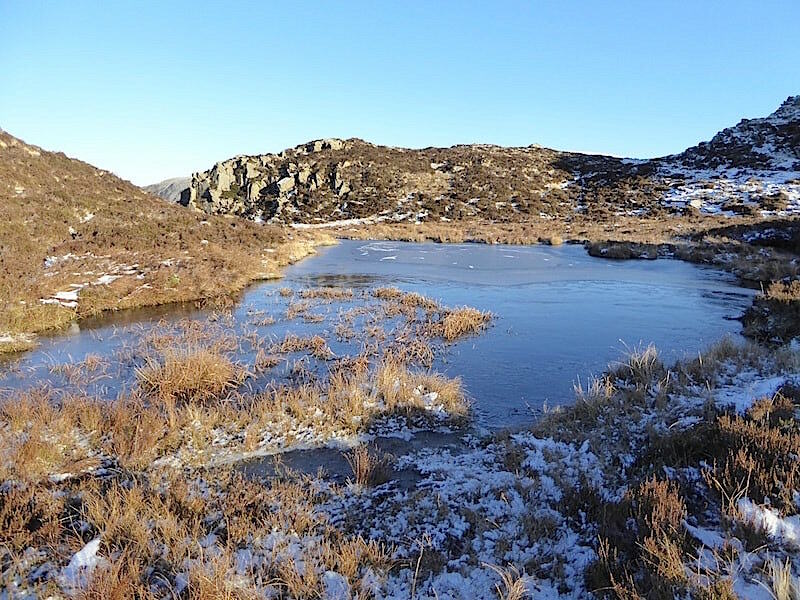 No problems today though, all the paths, pools and puddles were frozen solid. 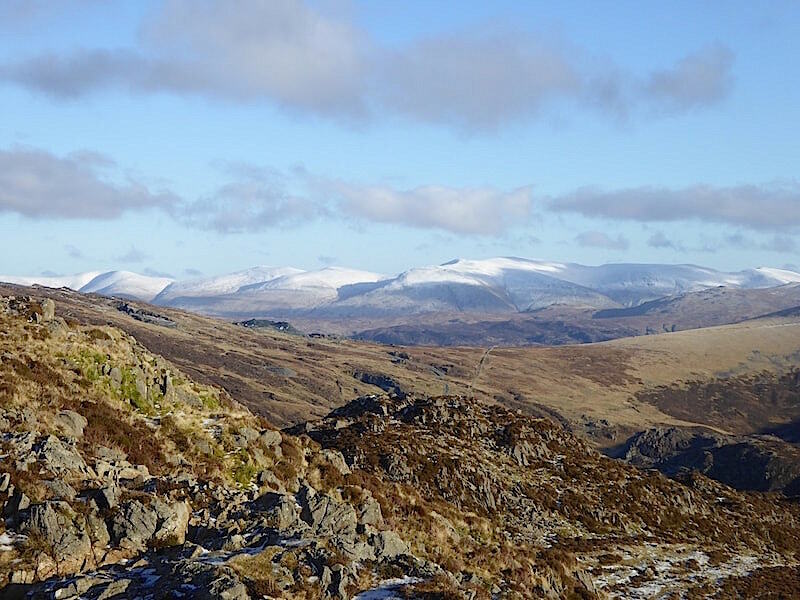 A splendid view of the fells to the west of us, snowy Grasmoor, and the snow sprinkled Robinson linking itself to Hindscarth across Littledale Edge. 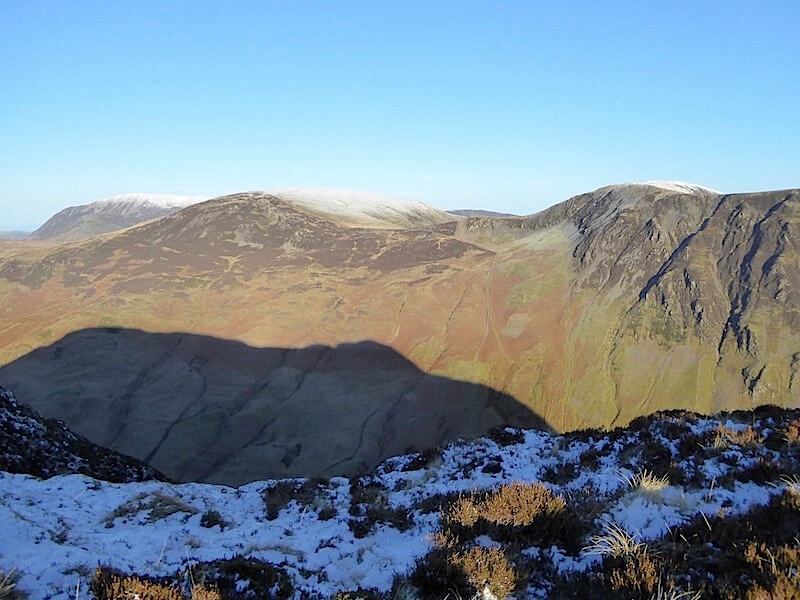 Causey Pike appears above Littledale Edge but we had no sighting of walkers on Hindscarth. 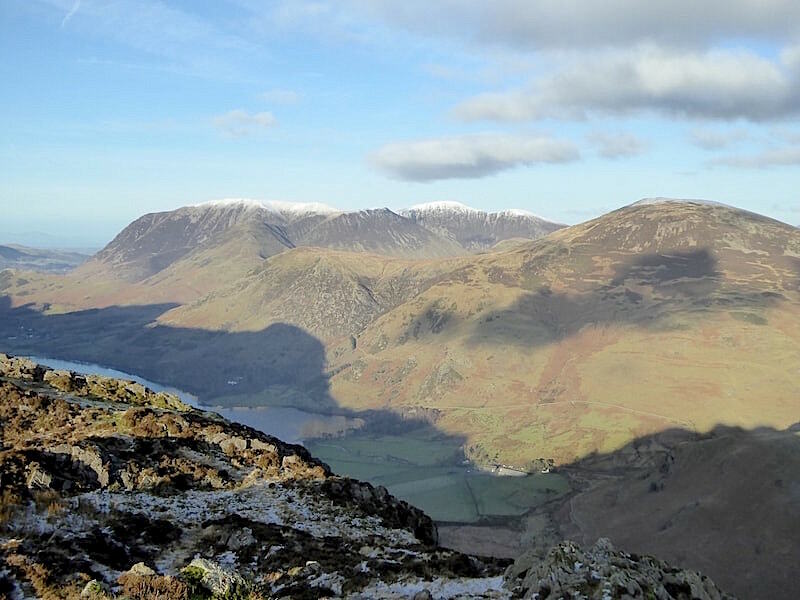 The lovely view, along Buttermere and Crummock Water, from Fleetwith Pike. We had a longish wait before we could get to the cairn. A group of four plus a group leader, who was doing a lot of talking and arm waving, were in residence. It was breezy again so we found a sheltered spot and got out the coffee until the group decided it was time to move. We didn’t hang about nearly as long as they did once we were back in the breeze at the cairn. 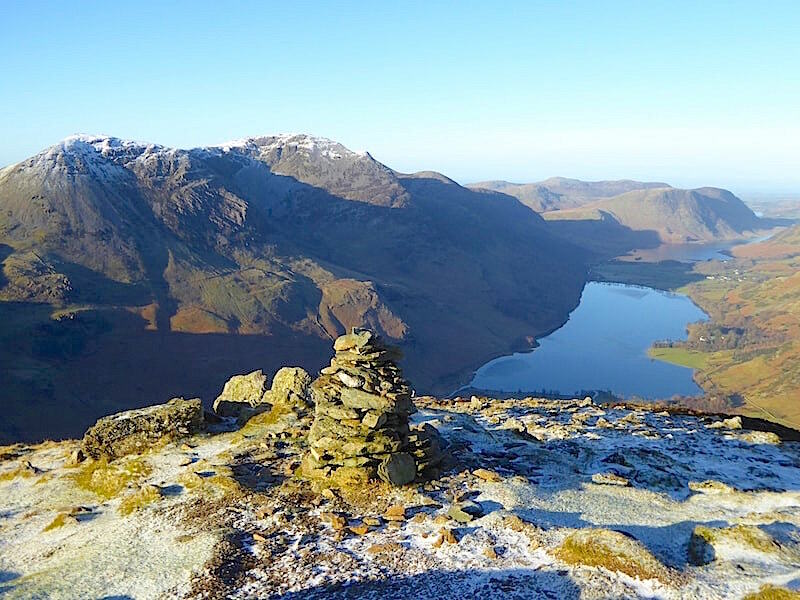 From the summit we made our way from the top of Fleetwith Pike down to the old spoil heaps at Dubs Quarry and a view of our next port of call, Haystacks, which is the dark brown fell going across the middle of the shot. 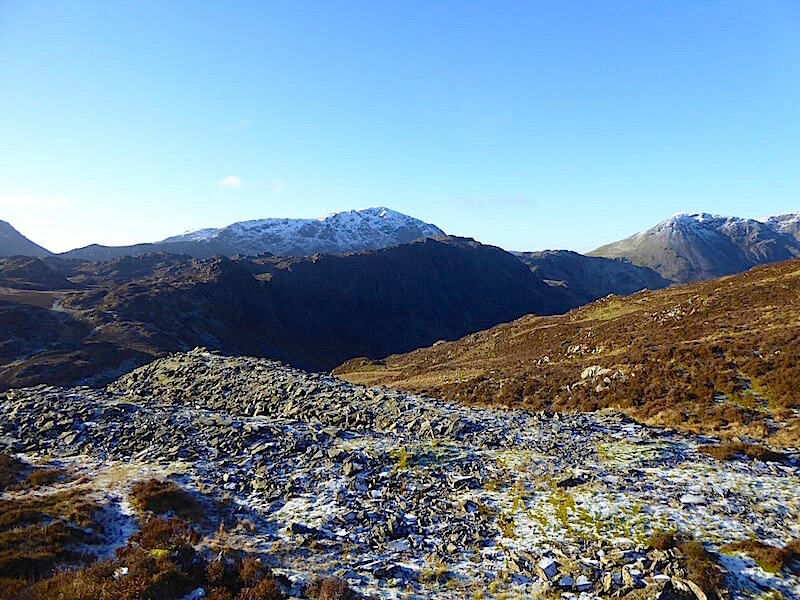 Haystacks is forever doomed to playing second fiddle to the giants of Pillar, right behind it, and High Crag over to its right. Its practically covered over with heather too so, apart from August when the heather is in bloom, Haystacks generally looks a little on the drab side in comparison to its near neighbours. Looks like Dubs Hut is getting a makeover. 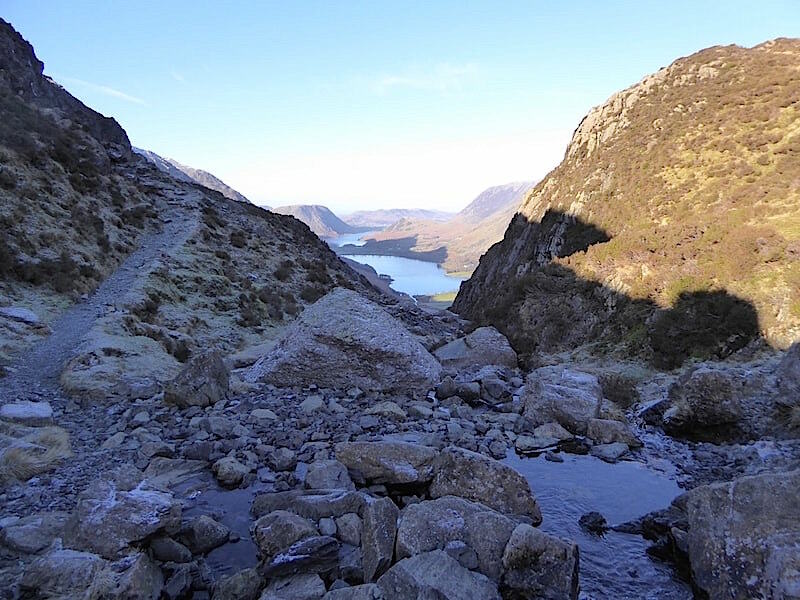 On the way down to cross Warnscale Beck and pick up the path on the other side which will lead us up to the summit of Haystacks. This was a very pleasant walk down, we were in full sunshine with not a breath of wind, the gloves were off and the jackets unzipped. The group who left the summit a few minutes before us seem to have vanished into thin air because we couldn’t see them anywhere. We cross the beck and join the path so I took a look back across to Dubs Hut and the spoil heaps …..
….. and a little further on we had another view along Buttermere and Crummock, with another walker in a blue jacket standing just below us, and looking our way, towards the centre of the foreground. He’s difficult to pick out so a zoom in might be needed. 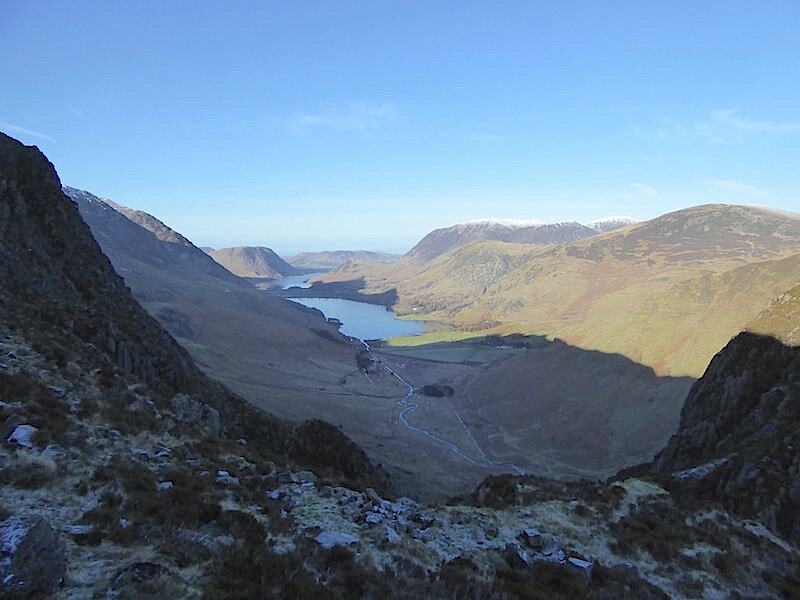 Crossing the deeply shaded Black Beck and a little higher up the path on the left is …..
….. another grand view along Warnscale Bottom and Buttermere. The path becomes rougher a little further along but it doesn’t last long and we soon arrive at …..
….. a small level area where we had to wait a minute or two while a family with some young children made their way down the steeper pitched path which rises right behind me. 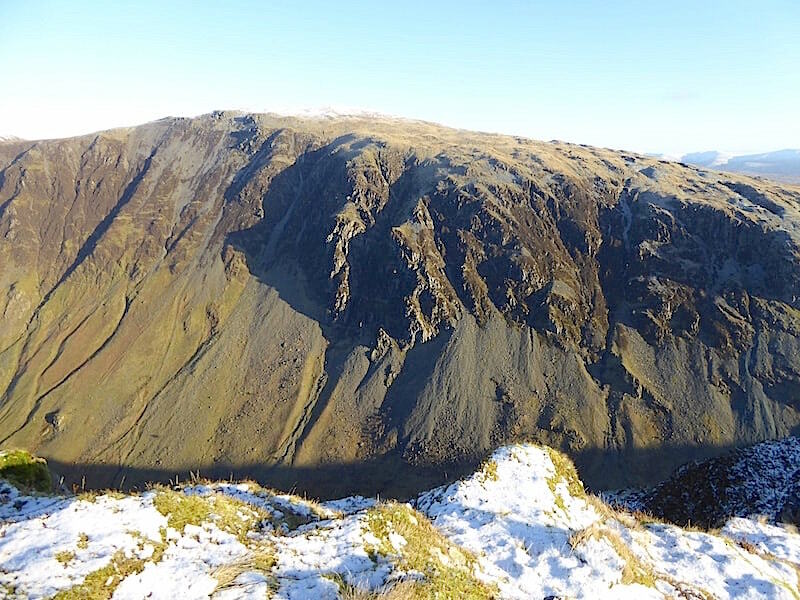 While I waited I took this shot of Fleetwith Pike across from us. 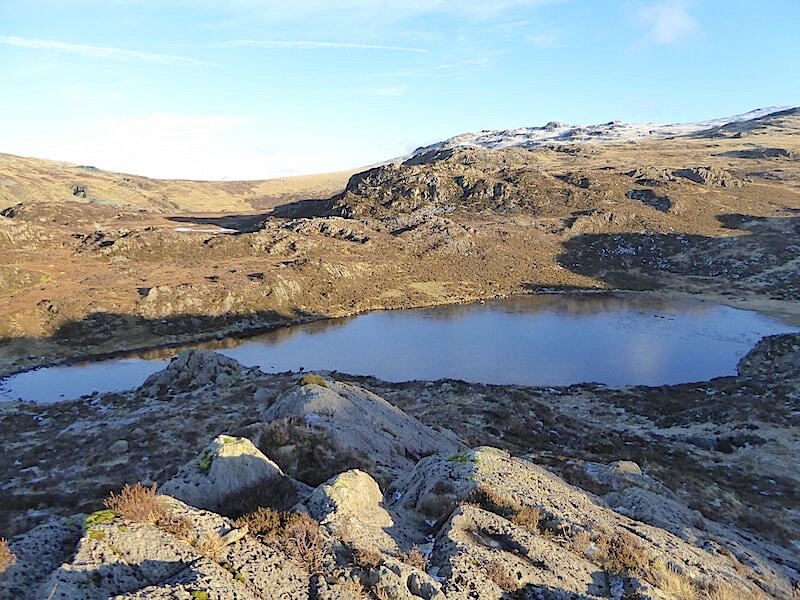 We stopped at Innominate Tarn, perched ourselves on some handy flat rocks, got out the soup and sandwiches, and spent a very peaceful fifteen minutes just enjoying the views and the stillness. No-one came along the path during that fifteen minutes, a rare event for us to experience because there has always been someone on one of the paths every time we’ve been up here. Its AW’s final resting place so our conversation naturally turned to him and his guide books. 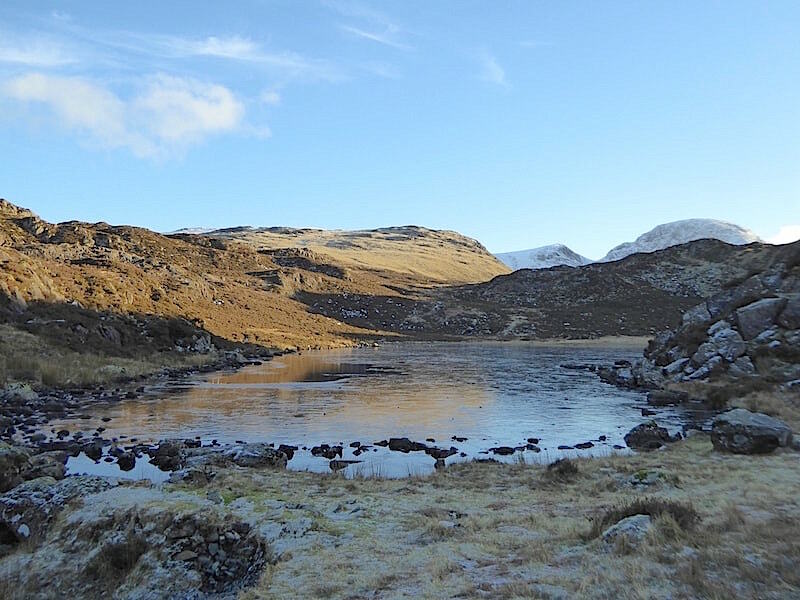 Once we had stowed everything away and hoisted our packs to move off up to the summit other walkers began appearing again and the silence was lost in the crunch of boots, the icy shards being skimmed across the frozen surface of the tarn and the general conversational hubbub. 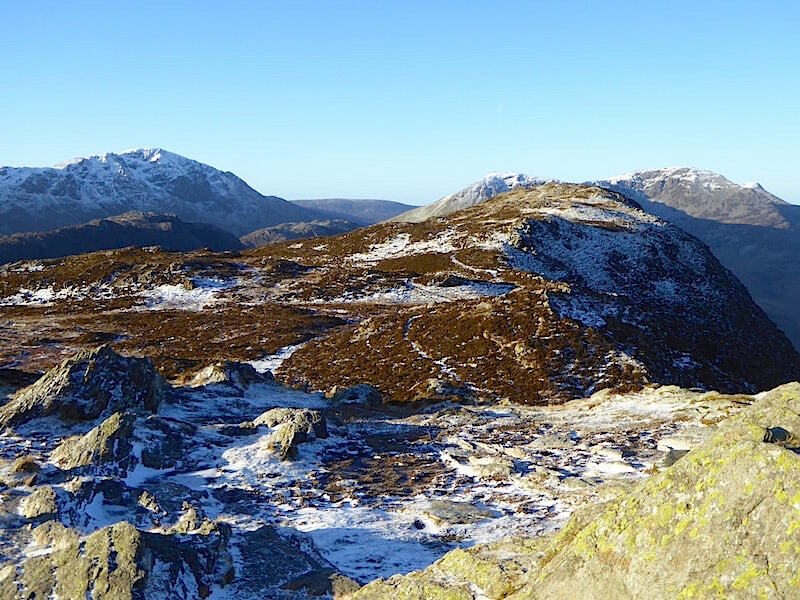 Looking across to the summit of Haystacks which is left of centre on the skyline. No ripples, just a film of ice across the surface and by the time we left dozens of ice shards were littering the surface after the impromptu shard skimming competitions. 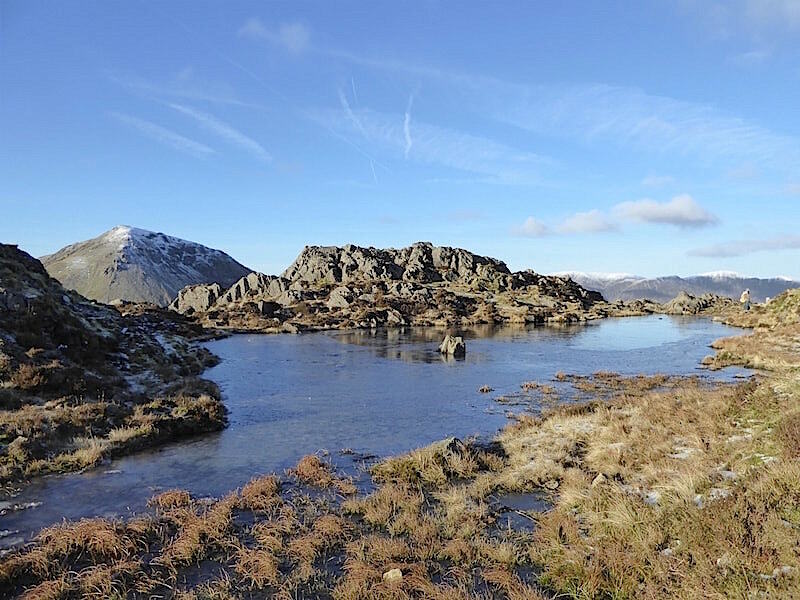 We make our way up to the summit with a stop here for a look back at Innominate Tarn on the left, another un-named tarn just below us, and Green Gable and Great Gable dominating the right skyline. We had a chat with a couple of cheery lads from Huddersfield who came up the path alongside us. 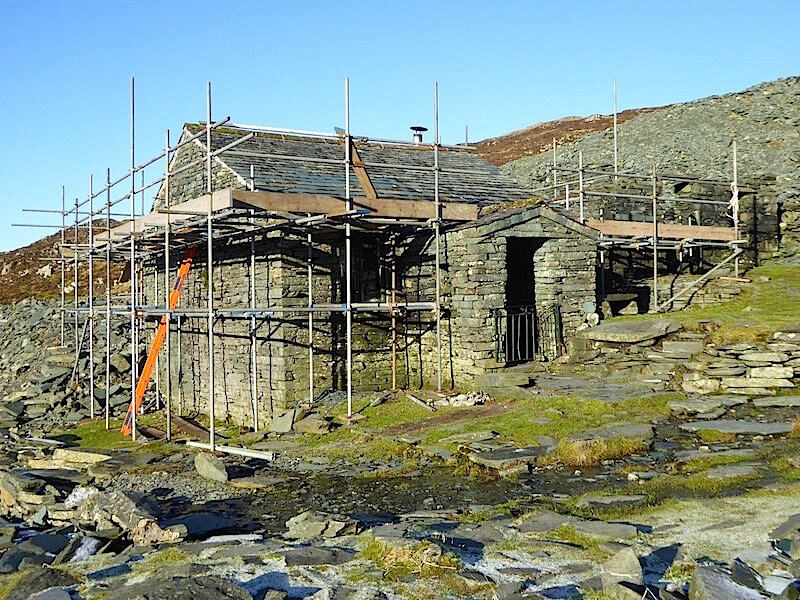 They had camped out overnight close to Dubs Hut and had hoped to spend the night in the Warnscale bothy, but a group was already in there when they arrived so a spot of wild camping was the only option. Apparently they were very ‘toasty’ in their sleeping bags and tent during the very, very cold night. Not for me though, toasty or otherwise, I will never be a happy camper because it just doesn’t appeal to me at all. We reach the summit and its so crowded you could be thinking that a works outing had just arrived. However a lull in the traffic afforded the opportunity for a shot from the cairn at the eastern end of Haystacks. 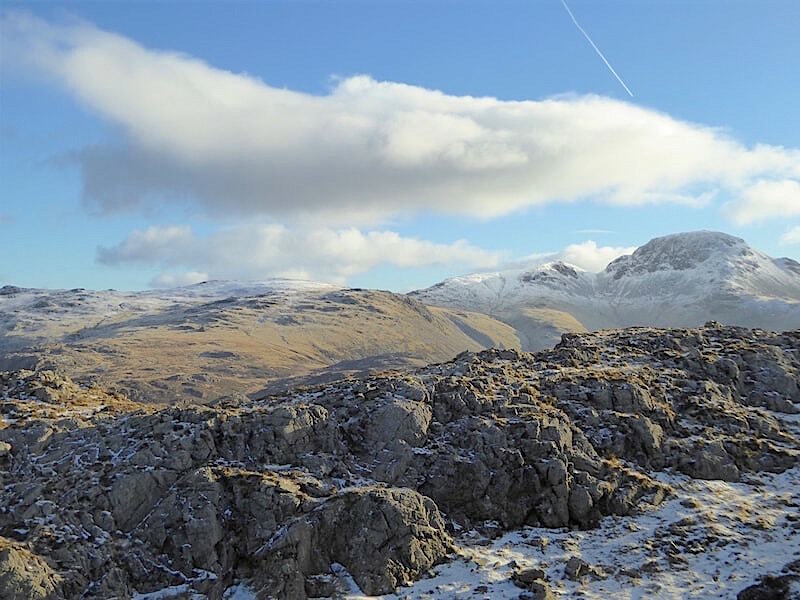 On the skyline from left to right we can see Grey Knotts, Brandreth, Green Gable and Great Gable with a few clouds drifting over all of them. Hmm, where did they come from all of a sudden? 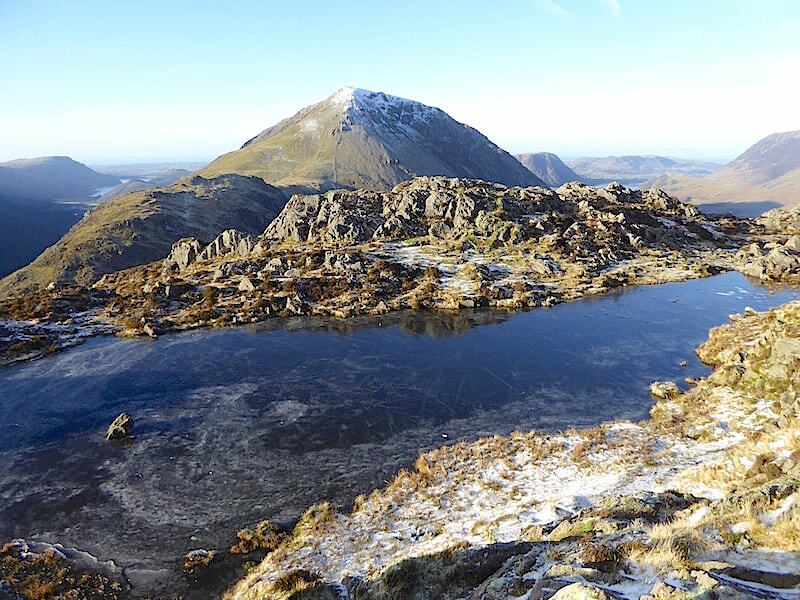 Below its summit Haystacks has another tarn with no name which, along with all the others we’d passed, was completely iced over. 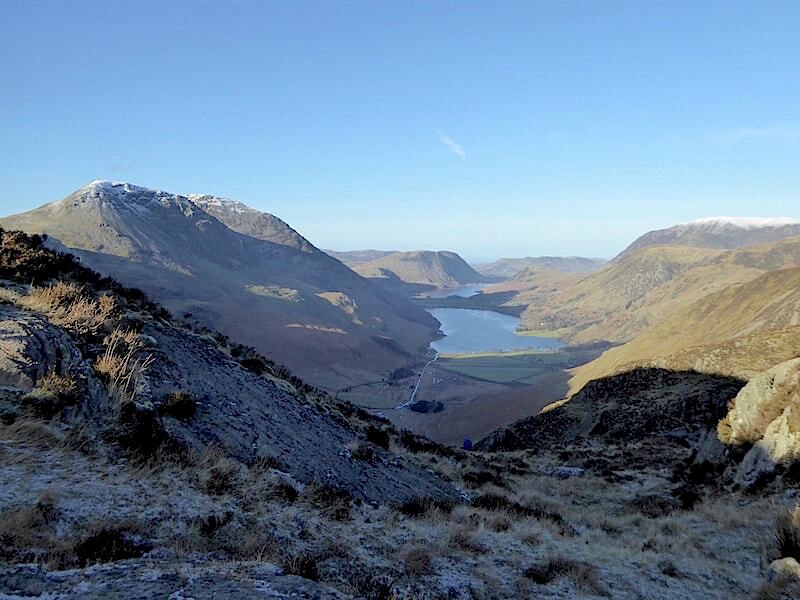 I intended to go down to the rocky knoll in the centre, to take a shot along Buttermere, but the breeze was biting again so I didn’t bother. 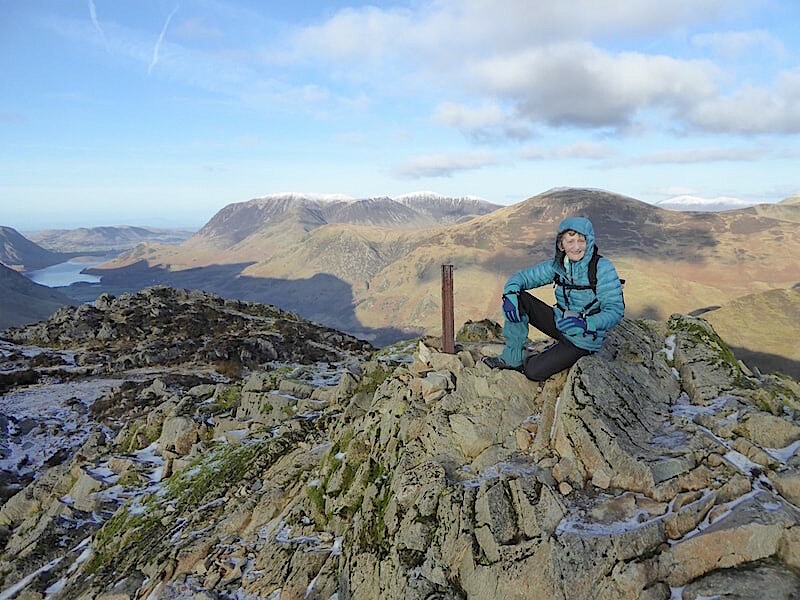 Squinting against the sun and perched by the iron post at the western end of Haystacks summit with my hood flapping in the breeze whilst waiting for the photographer to find a flattish footing amongst the upended rocks and take the shot. 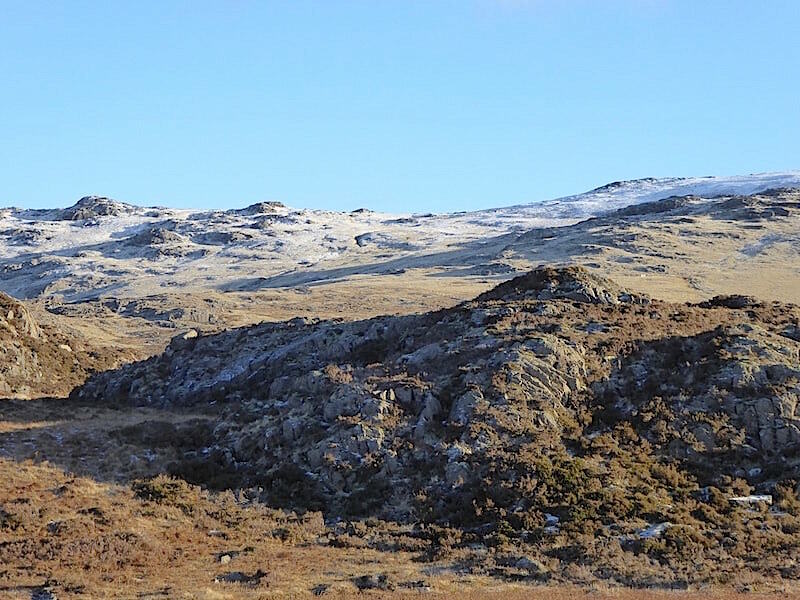 A look along the summit area towards the eastern end and finding that the crowd of walkers has magically disappeared. 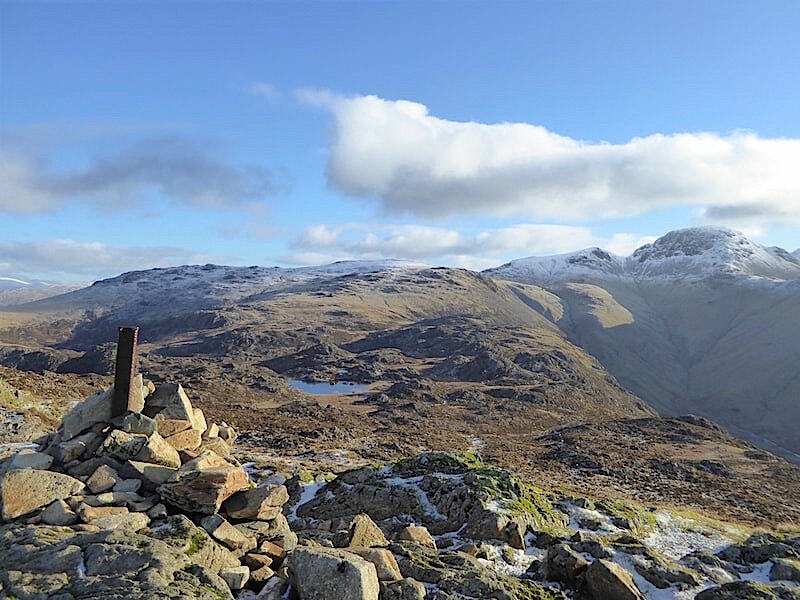 A peep over to the right hand side revealed that they had all decided that it was too breezy and had taken shelter out of the breeze on the sunny side of the summit alongside the tarn. 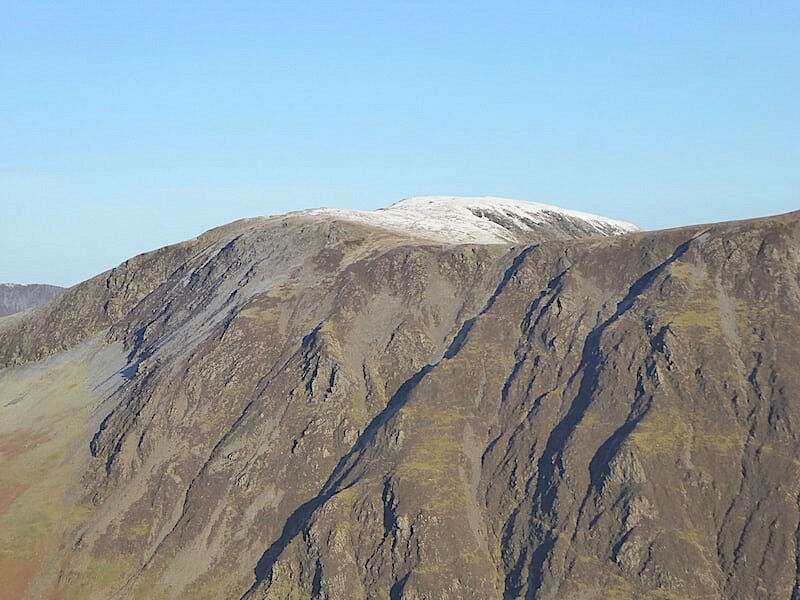 Despite the nippy little breeze I decided that the absence of other walkers might be a good time to take a few summit shots, this one looks across to Brandreth, left of centre, and then over to the right are Green Gable and Great Gable …..
….. to the west, in the middle foreground, is Fleetwith Pike although its summit is somewhat obscured by the snowy top of Hindscarth right behind it …..
….. still looking west and in the centre, above Littledale Edge, the snowy tops of the Skiddaw fells are visible. 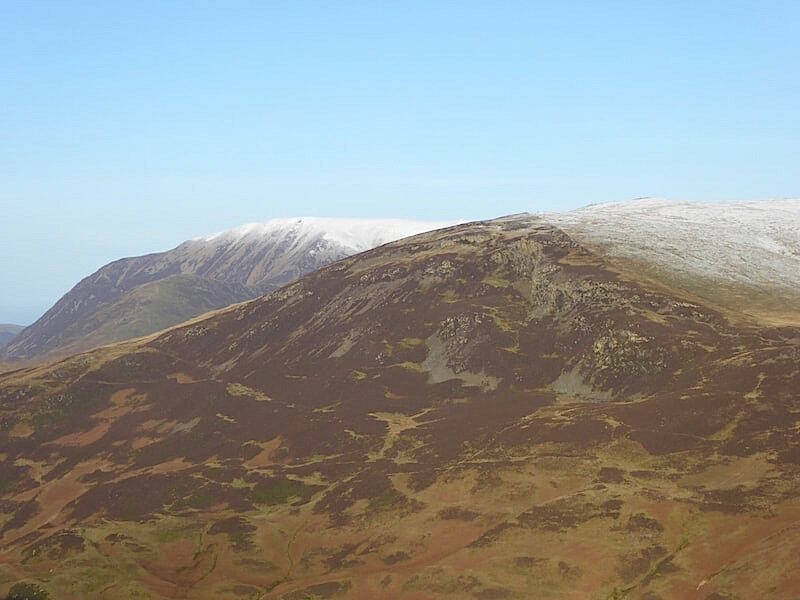 Over to the left are a couple more snowy tops, those belong to Crag Hill and Sail. 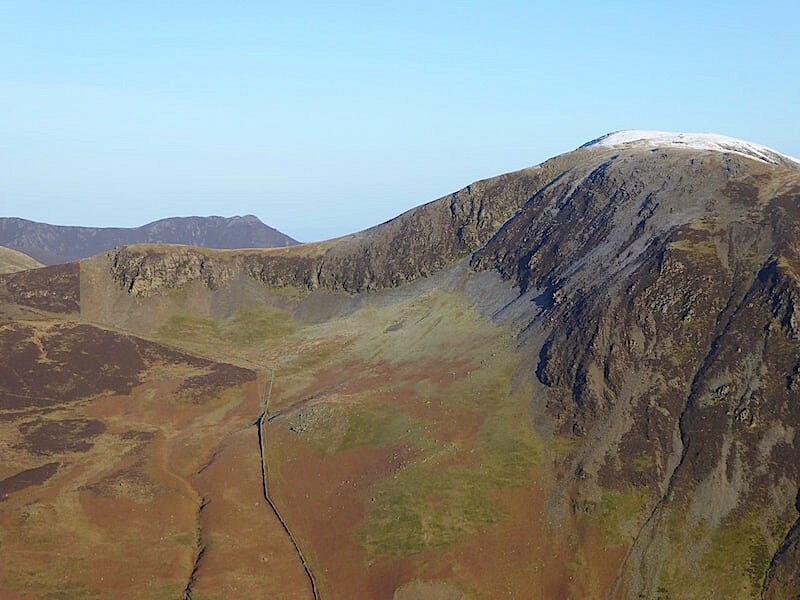 ….. and beyond Robinson the Grasmoor group of fells also have a snow topping. 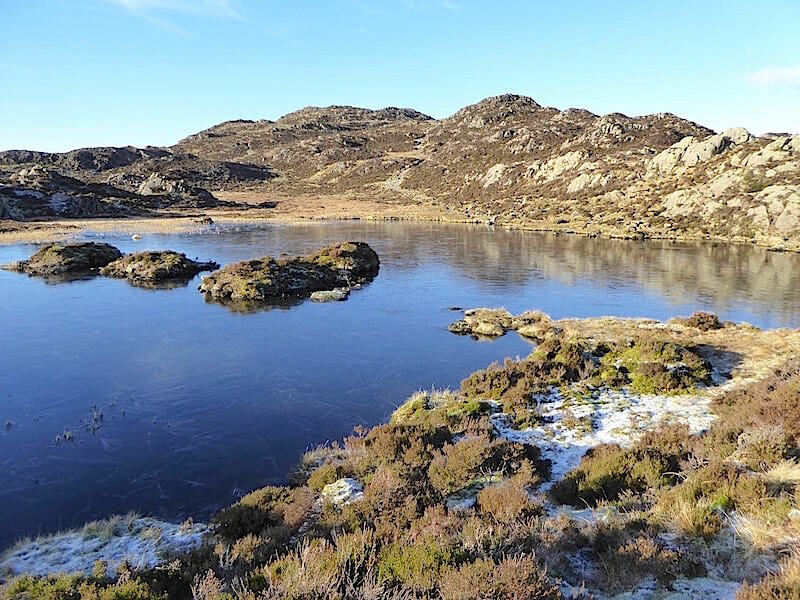 Back down at the tarn and out of the breeze to have a few minutes worth of sunny warmth together with our fellow walkers, a couple of whom can be seen on the right at the far end of the tarn. It was so sunny and calm along here you might almost have wished you’d brought a picnic, we’ve been up here in some summers when the weather hasn’t been anywhere near as good as this. 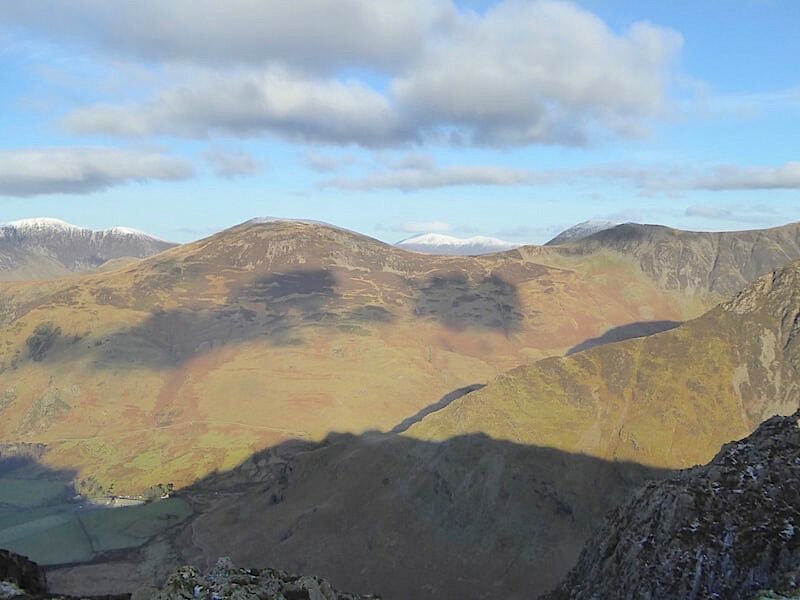 Summit time comes to an end and we start to make our way back down with this fine view of the Dodds and the Helvellyn range for company, everyone else is still hanging around at the tarn enjoying the sunshine. 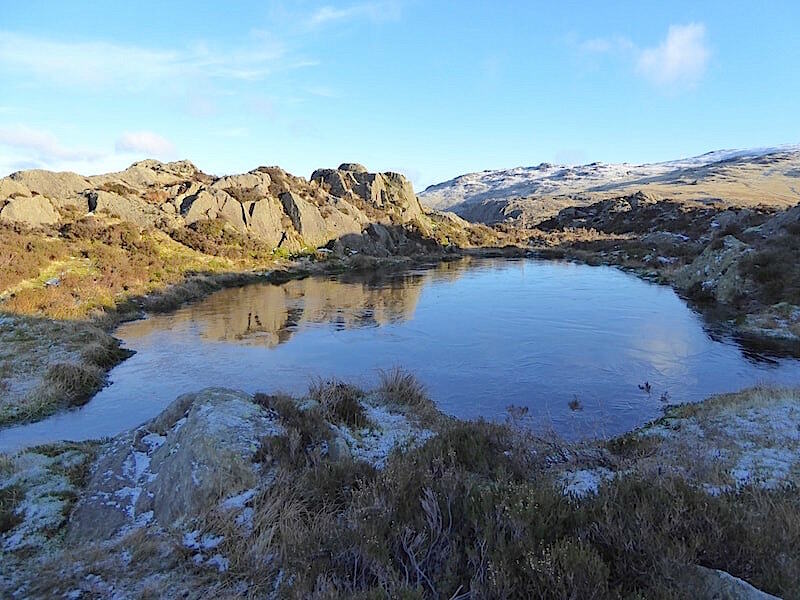 Its not a long descent so its not too long before we are back at Innominate Tarn where we decided to vary our return route slight and go back via Blackbeck Tarn. 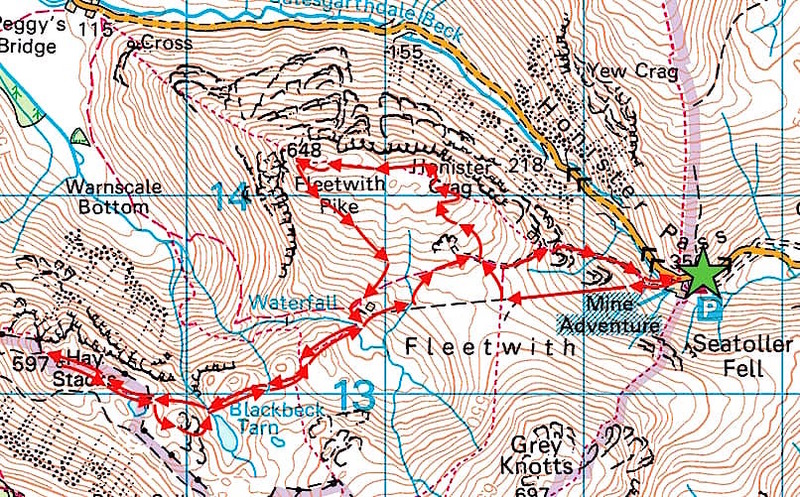 Its only a slight detour but it does cut out the steepish pitched path and the rough and rocky one above the Blackbeck Tarn outflow. 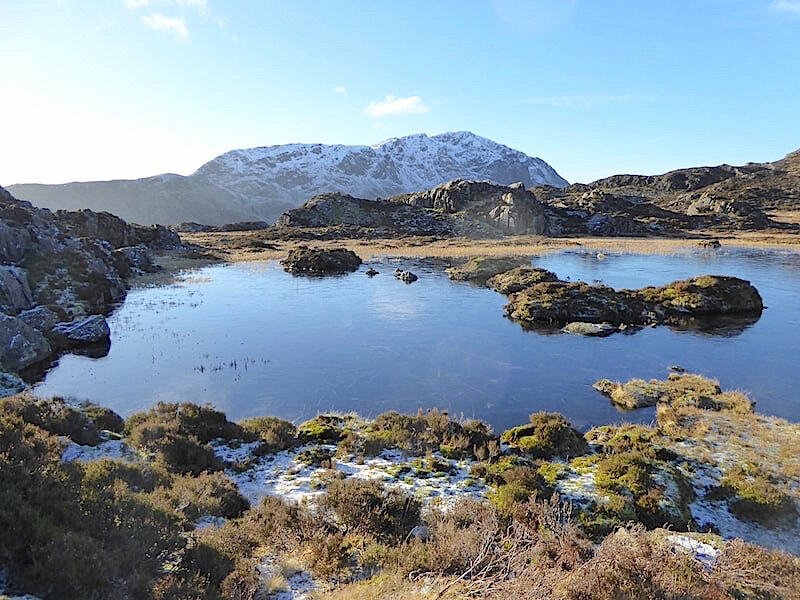 On the way over to Blackbeck Tarn we pass by yet another un-named tarn situated slightly above Innominate Tarn. 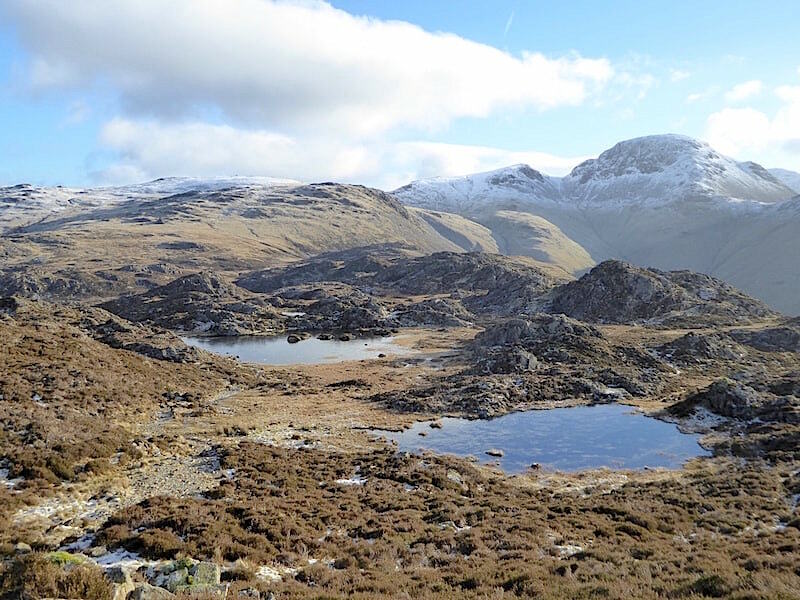 The whole area is dotted with tarns of all shapes and sizes so you’ll probably come across one or two wherever you walked up across here. 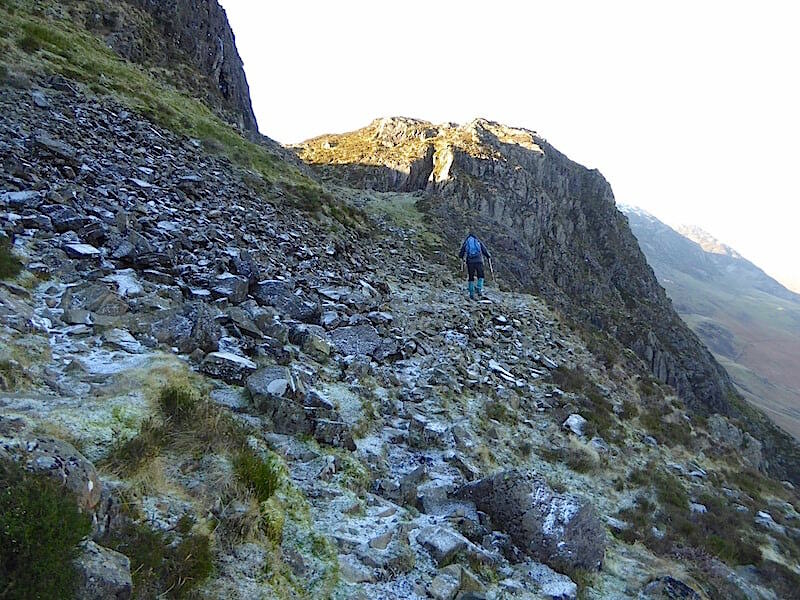 Crossing what would normally be a squelchy section on the way to Blackbeck Tarn with Green Gable and Great Gable peeping above one of Haystacks many knolls and outcrops. 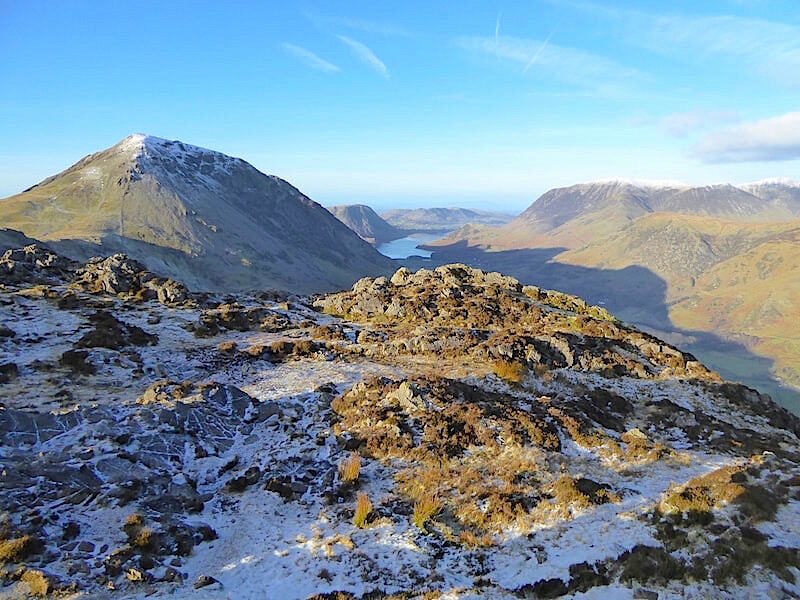 What Haystacks lacks in height and colour it definitely makes up for in interest. You could spend a whole day up here and still not get to grips with all of it. 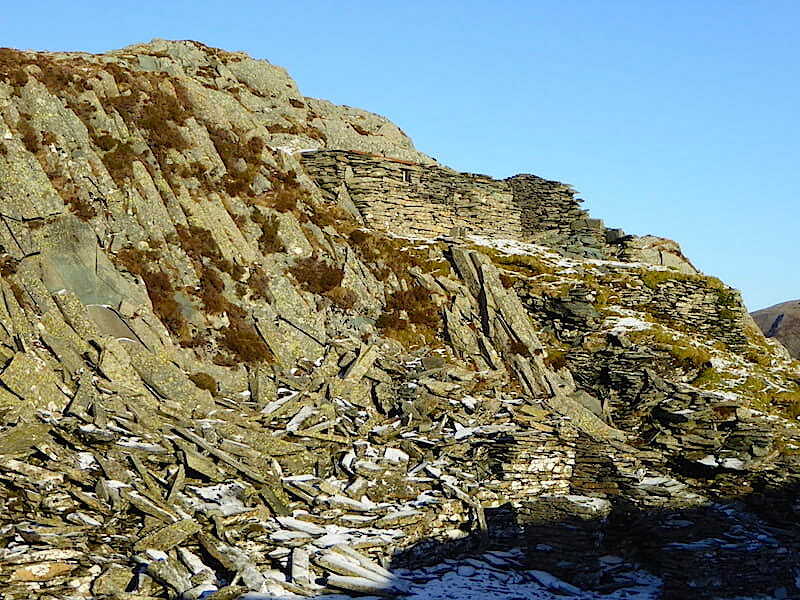 There’s plenty of scope for rock climbing and scrambling activities too. 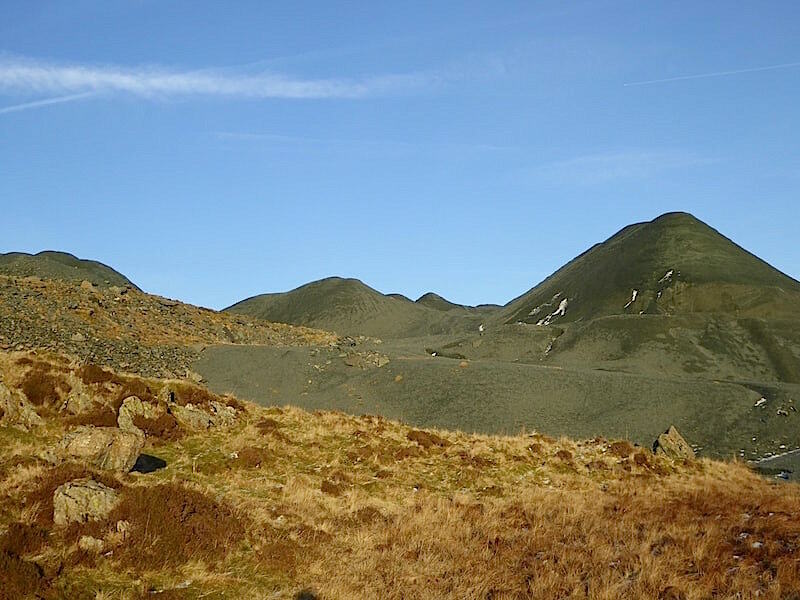 On the skyline Grey Knotts rises up to Brandreth as we approach the tarn …..
….. and just around the next outcrop there is Blackbeck Tarn …..
….. with another view of it from its outflow. 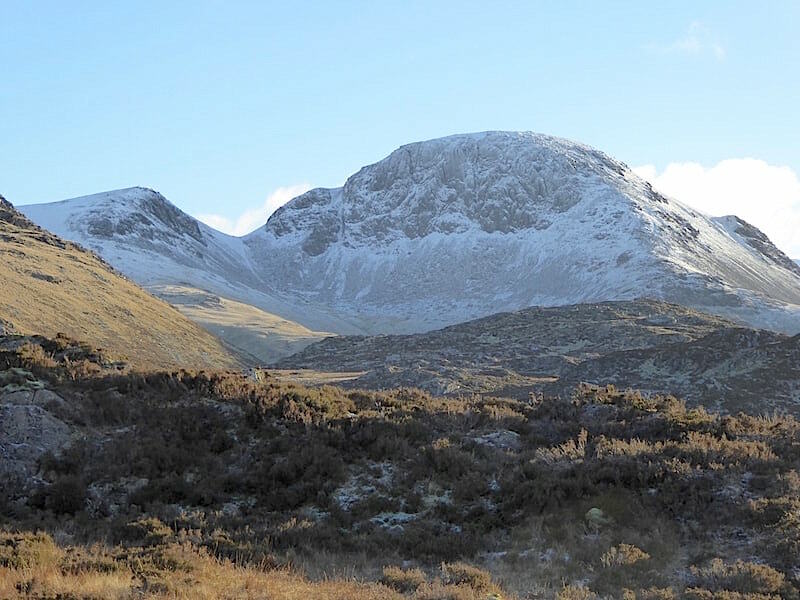 A marvellous view of Green Gable and Great Gable as we make our way back to Dubs Bottom. We wondered if Windy Gap, between the two, lived up to its name today. 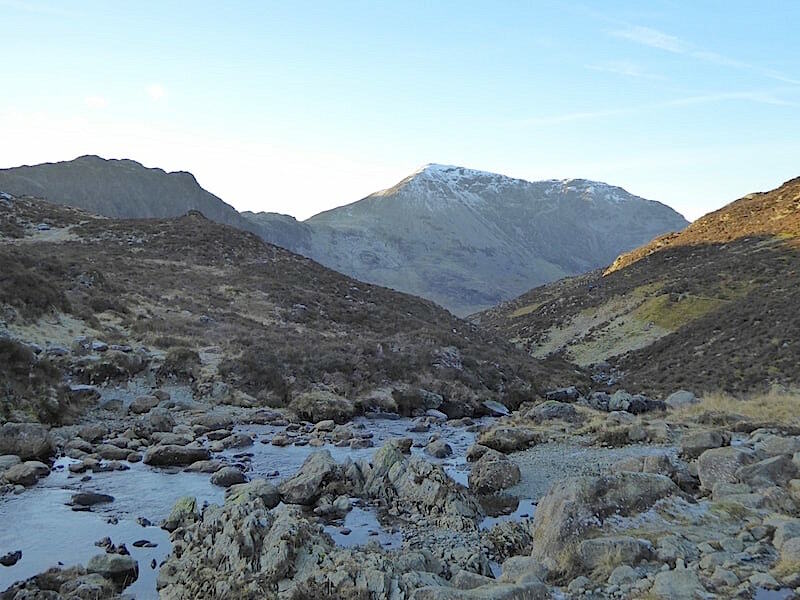 Back across Warnscale Beck with a look back at High Crag with Haystacks in deep shade to the left of it. 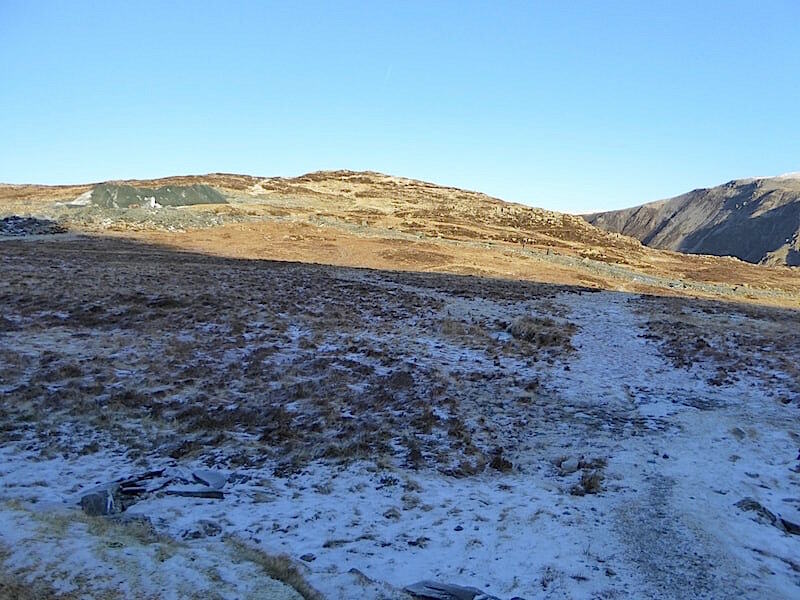 We head back up to Dubs Hut and then take to the mine road for the walk back to Honister. 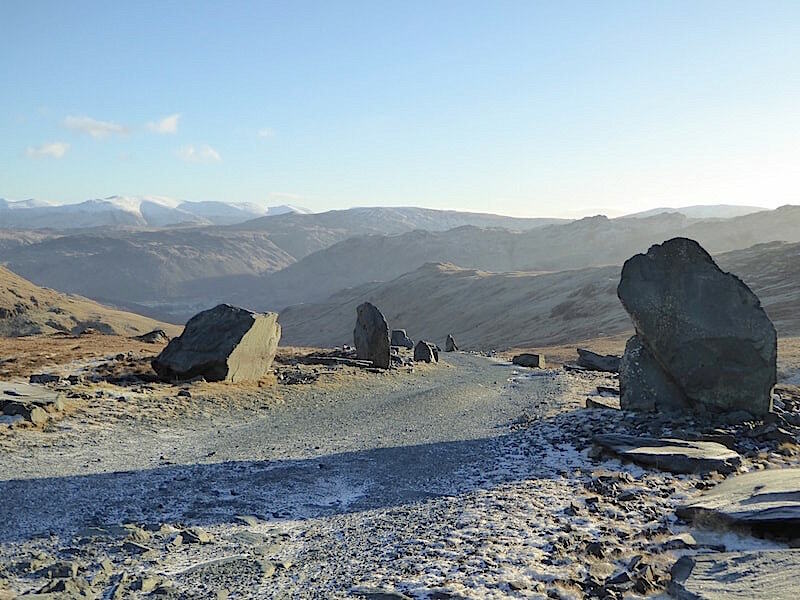 From the mine road you could be forgiven for thinking that you’ve stumbled upon some un-named fells, but this alien looking landscape is nothing more than a large group of monumental mounds of spoil from the slate mine’s heyday. 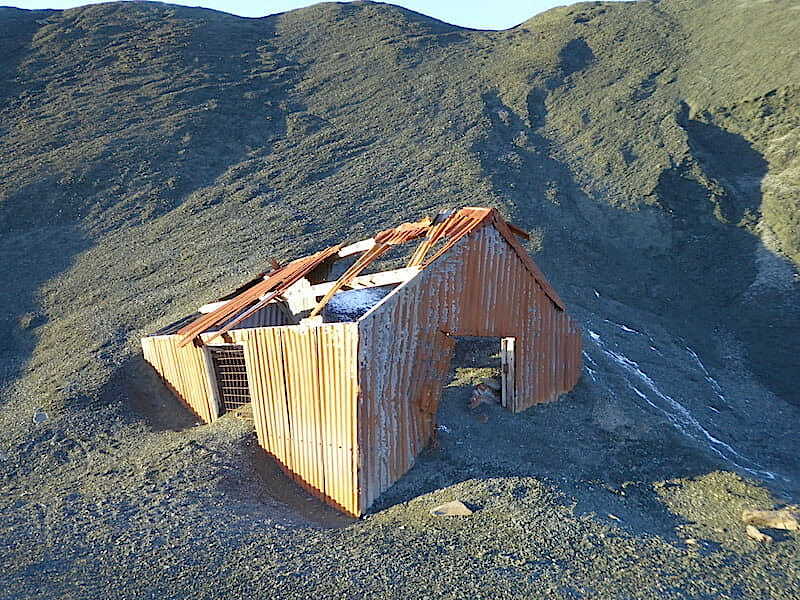 The old corrugated iron shed is slowly being swallowed up as the spoil inches its way downwards. One of these days it will disappear completely so before it does I grabbed a quick souvenir shot. 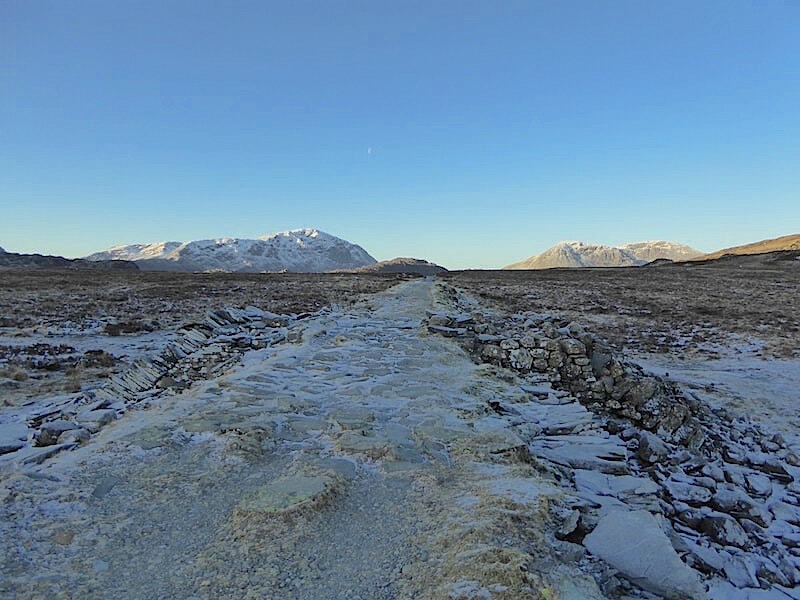 Back on the ‘ceremonial avenue’ for the walk back down to the mine buildings. Its called ‘Honister Henge’ in our house. Well here we are, almost back at the mine’s reception and cafe area so that’s the end of our walk today. Its been a grand little walk in brilliant weather and, as far as we can tell, tomorrow promises more of the same. If that comes to pass then no doubt we’ll be back out again for another walk tomorrow, back muscles permitting of course.